Do you have a passion for improvement? Don’t settle for the status quo or blindly jump on the bandwagon to pursue the “program of the month.” Learn how to leverage Outcomes Thinking to achieve true game-changing team performance. High-impact coaching is a top priority for organizations that want to thrive today. There are many coaching approaches to choose from, but almost none of them help define the target for a solid, performance-based coaching program. 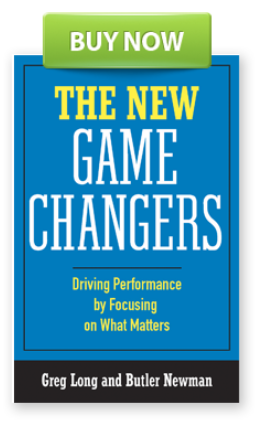 Learn how to drive role-specific transformational change by uncovering and coaching to the targeted outcomes that matter, the ones that directly add value to the business. Many learning organizations are out of control. In their efforts to stay relevant to the business, they offer increasing quantities of ever-more tenuous courses that don’t improve performance or drive business results. Learning management systems are often rendered useless under this avalanche of offerings. This presentation offers a simple yet powerful solution to this problem that organizations can use tomorrow. To book Greg Long and Butler Newman for keynote or other speaking engagements, please contact them at speaker@longandnewman.com.